Pure entertainment of the first order! 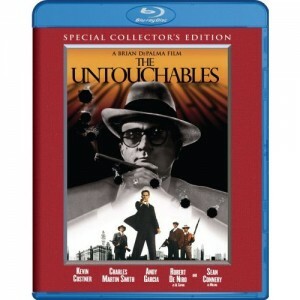 The Untouchables (Special Collector’s Edition) , Brian DePlama and David Mamet’s film version of the old early 60’s TV show (and based on the real-life exploits of Bureau of Prohibition Agent Eliot Ness), is a completely re-watchable movie from start to finish. Well written by Mamet, it features lots of quotable dialog and memorable sequences staged so brilliantly by Brian DePlama as to overshadow much of his earlier, Hitchcock-style, suspense films. Two of the most well-known sequences, the meeting where Al Capone plays baseball with the noggin of one of his mob “employees,” and DePalma’s tension-filled Union Station homage to Sergei Eisenstein’s “Odessa Steps” sequence from the 1925 epic Battleship Potemkin are amazing in the way they play with audience expectations and the utter audacity with which they’re staged. The actors are all in fine form here, with De Niro creating a Capone for the ages (both physically and dramatically), Connery chewing scenery with his Scottish brogue delivery (playing an Irish cop in 20’s Chicago), and Kevin Costner, in Gary Cooper mode, as straight-laced Ness, putting in a performance that rivals Robert Stack’s command of the role on network TV . Supporting roles are handled well by Andy Garcia and Charles Martin Smith (and hey! gorgeous Patricia Clarkson shows up as Ness’s wife in a few scenes), but it’s Billy Drago who has the ultimate villain role as Capone’s nasty enforcer, Frank Nitti… he’s a complete sociopath whose bloody hands are in every dirty job (unlike in real life, where he assumed control of Capone’s organization through cunning and his business skills rather than resorting to murder). Nitti’s attack on Malone (Connery) is another stand-out sequence that recalls some of Coppola’s most operatic moments in the Godfather Trilogy (considering its use of the tragic Italian opera Pagliacci, it ought to). The Blu-ray disc is a hi-def remaster that found its way to the standard-def 2-Disc Collector’s Edition a while back and it looks gorgeous… save for some noticeable edging issues. Using a high-bitrate AVC MPEG-4 (1080p) transfer, the video elements look lovely with very good color saturation (I noticed the tiniest bit of bleed, heh heh, the in the reds… perhaps that’s because the blood flows quite a bit in this film). The black levels are top-notch and the deep browns prevalent throughout the film give off plenty of sharp detail. The 2.35 widescreen image shows off Stephen H. Burum’s cinematography in all its richness. The audio does an equally terrific job if using the DTS 6.1 (1.5 mbps) matrixed surround selection… as soon as the first aggressively urgent thrums of Ennio Morricone’s classic, powerful score come rumbling out of the speakers it’s apparent Paramount’s release is well worth the buy. The DTS-HD mix is very fine in letting the score roll off the rear speakers, but the 6.1 channels largely come into play during certain actions sequences, especially the Union Station sequence. Dialog comes across clear and understandable, hitting very warm tones from the center and side channels. The DD-EX 5.1 surround selection offers up to 640kbps bitrate compression and also sounds pretty darned good for a film released in 1987 before the advent of digital soundtracks (there’s also a DD-EX 5.1 track in Spanish or French at an even lower bitrate. Subtitles are in English, Spanish and French), but it lacks the sonic spatial quality of the DTS track. The special features are identical to the 2-Disc Special Collectors DVD edition and still manage to include no audio commentary from DePlama (who really doesn’t like to do ’em)… what you get is The Script, The Cast which includes a few interviews with DePalma, producer Art Linson and (via older inter-cut footage) the cast; Production Stories is an in-depth look at how Cinematographer Stephen H. Burum achieved the period look of the film; Reinventing the Genre is a look at how DePlama conceived the film’s overall place in the gangster genre and also dissects two of the films most violent sequences while offering up some deleted bits, The Classic offers up a conversation about the film’s memorable musical score; there’s also an EPK featurette called The Men that was used to promote the film and a theatrical trailer (new to the Blu-ray/HD DVD release, it’s in hi-def 1080p).